How to select raw materials. Plants cultivated by their own vitalities. Brown rice is the most favorite nutrient for EM (effective microorganism). EM technology is based on “ BOKASI”, a fermented material, which is made from powdered brown rice which is fermented once and then dried. Brown rice has been well known to be good for useful microorganisms in Japan since ancient times. Vegetables are pickled in salted rice-bran paste with lactic acid multiplied made from a fermented brown rice, and then they acquire good taste and nutrients. This method of making preserved foods is called “Nukazuke” and “ Nukazuke”pickles are among the most favorite pickles in Japan . 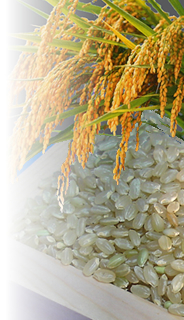 Brown rice contains abundant anti-oxidization substances such as γ oryzanol , phytic acid and so on. As it has very strong anti-oxidization power, it can germinate several years after it has been left in its natural state. In Takahashi farm we use only brown rice as a material of “Balance alpha ”, produced perfectly free from agricultural chemicals and chemical fertilizers. Loquat has been used as a medicinal herb in China and India since before the time of Christ. It is called “ King tree of great medicine” , as it is the most effective medicine in China. The leaves and seeds of loquat contain much amygdalin, which is in the spotlight nowadays because it has anti-cancer effectiveness. In Japan hot-spring cures with leaves of loquat has brought good cure results to patients with malignant tumors. The petals of chrysanthemum are used because of the large amount of anti-oxidization pigment (polyphenol) contained therein. The chrysanthemum ,which is a material of “Balance alpha ”, had been a wild species “MOTTENOHOKA” until recently and was selected due to having less influence from the improvement of the different strains and having strong vitality. The chrysanthemum for “Balance alpha ” is peculiar to Yamagata Prefecture and has been called “life support medicine” locally since old times. As it is said,one could live longer if he or she ate it shows that it has been treated as a precious plant.